In one of many new series that will be running on the website for the foreseeable future, we will be taking a look at the most memorable deaths in the franchise, highlighting one every week. Starting off the Slasher Chronicles is a memorable death of a horny hospital worker that really enjoys watching aerobics. 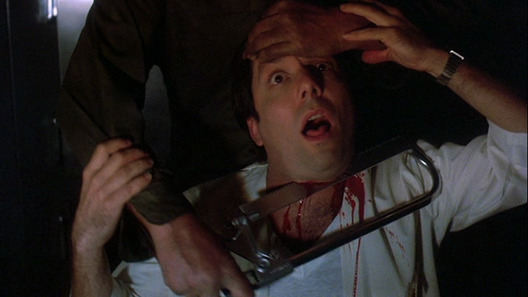 Outside of Jason Voorhees' own demise, one of the stand out death scenes in Friday The 13th: The Final Chapter was that of Axel (Bruce Mahler), an obnoxious coroner whose failed seduction attempts with Nurse Morgan (Lisa Freeman) results in him watching aerobics alone on television. Jason (Ted White), having awoken from the freezer after he was thought to have died from his wounds endured at the end of Part 3, sneaks up behind Axel and grabs him by his head. Using a surgical hacksaw designed for cutting through bone, Jason slices deep into his throat. A dummy head and shoulders was created utilizing a life cast of Bruce Mahler and using a saw filled with blood, was placed against the throat, which also allowed for the head to be violently turned backwards as Jason sunk the blade deep into his neck. Axel's death is brutal, gory, and unsettling and it set the true tone for the film that fans were to witness of Jason's first final chapter.